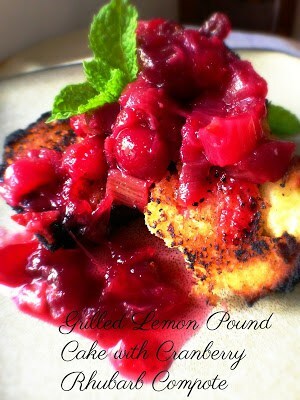 Grilled Lemon Pound Cake is served with Cranberry Rhubarb Compote. 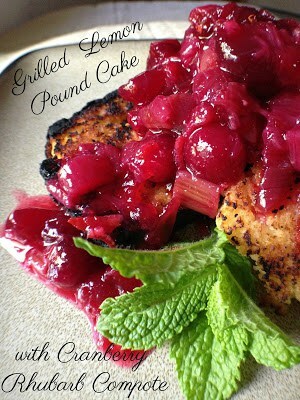 If you have never grilled pound cake before then you are in for a delicious surprise! Any ‘flavor’ of pound cake can and should be grilled. Lemon, vanilla and butter flavored pound cake are our favorites. We like to served grilled pound cake topped with grilled fresh pineapple and whipped cream. Talk about delicious! Another favorite, grilled peaches or plums. Another great choice for grilling is Angel Food Cake. Topped with roasted, balsamic strawberries or fresh strawberries macerated with vanilla sugar. Delicious!! Who needs chocolate! Grilled pound, angel food cake and grilled fruits scream Summertime to me. Whipped cream or ice cream is optional but always greatly appreciated. Compote [KAHM-poht] A chilled dish of fresh or dried fruit that has been slowly cooked in a sugar syrup, which may contain liquor or liqueur and sometimes spices. Slow cooking is important for the fruit to retain its shape and for the flavors to penetrate the fruit. This recipe for compote is freezer friendly too. 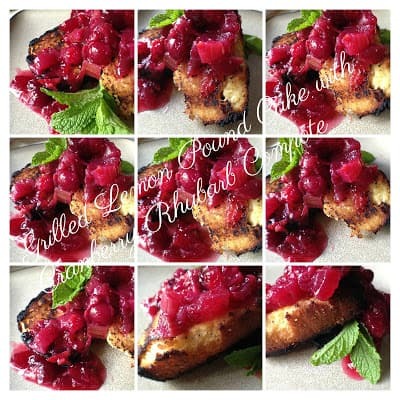 Cranberry Rhubarb Compote is delicious. Cranberry and Rhubarb are meant for each other. They compliment each other beautifully. If you like Strawberry and Rhubarb together, you will love the combination of Cranberry and Rhubarb. When cranberries are in season, usually in late October through December, pick up a few extra bags and throw them in the freezer. In the spring when rhubarb is in season make up a batch compote. The secret to grilling pound cake is to lightly oil the grill grate with a wire grill brush, lightly brush both sides of cake with melted butter and watch cake very closely, grilling time is only a few minutes per side. It will burn, quickly, so keep an eye on it. What are you waiting for?? Go get grilling! Using a spoon stir together water, melted butter, and cake mix until blended. Spoon batter into 8-inch loaf pan, lightly sprayed with non-stick cooking spray. Bake 44 to 46 minutes or until toothpick inserted into center comes out clean. Cool in pan 5 minutes; gently loosen and remove from pan. Preheat a grill or grill pan to medium-low. Lightly oil the grill grate with a wire grill brush. Slice pound cake into 1-inch slices. Brush the pound cake slices with melted butter. Grill until the cake is toasted, about 2 to 5 minutes on each side. 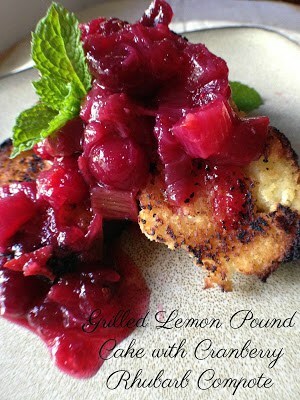 Serve with cranberry rhubarb compote. Place over medium heat, cook slowly for 1 hour, stirring occasionally or until berries start to pop but are still whole.